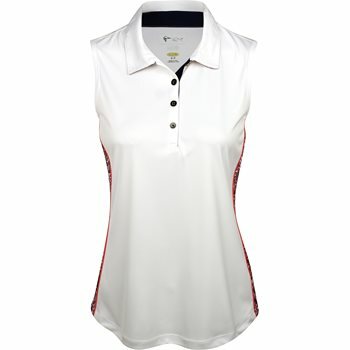 The ML75 Hylton Sleeveless polo by Greg Norman is an elegant seasonal style of the Regency collection. It features ML75 technical fabric that offers a luxury feel and moisture wicking to keep the skin dry when sweating occurs. Additional benefits of the fabric include UV protection from harmful sunrays, durability for machine washing, and resistance against shrinking and wrinkles. This beautiful style is designed with a tailored collar, bandana print side panels with coral sunrise piping, a buttoned placket, and sleeveless construction for easy swing motion.